Is there a special girl in your life with a birthday coming up this month? The July Medium Petites Necklace is the perfect way to flaunt the birthstone. It also acts as an excellent compliment to the other PANDORA pieces in a collection. 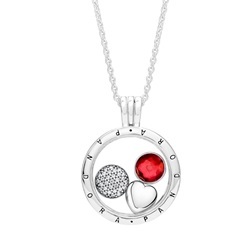 This necklace features a medium-sized locket with a set of Petite Memories charms inside. The pieces includes a pavé cubic zirconia, sterling silver heart, and of course, the eye-catching synthetic ruby birthstone. Pick up this adorable set for a birthday gift today. 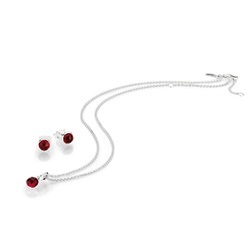 PANDORA’s July Birthstone Droplet Gift Set contains a pair of droplet stud earrings showcasing faux rubies encased in sterling silver. It also comes with a matching droplet pendant with a single stone that hangs from a ‘collier’ sterling silver necklace. Any woman would be proud to wear this gift set. 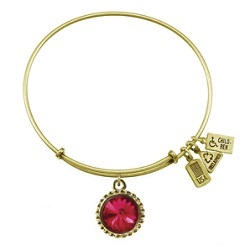 This July Birthstone Charm Bangle by Wind & Fire is another fine choice for a birthday gift this month. It is highlighted by a bright, ruby charm which is accented with three small charms noting that it is made in the USA, made from recycled materials, and supporting various charities. This beautiful bracelet comes in two colors – silver and gold. The July Signature Heart by PANDORA is the perfect charm for those born in July. The fiery ruby-colored stone represents both love and passion. Pick this up for the woman in your life that you can’t live without so she can add it to her unique PANDORA bracelet. For the finest jewelry boutique in Skippack, PA, visit us at URBANfusion or browse our online store. 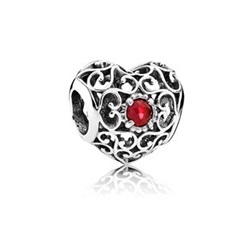 You can check out the rest of our ruby-themed charms by PANDORA as well as a plethora of jewelry highlighted with red that any woman would love to wear as a birthday gift from you.